Lenza Ophthalmologist: Oday Alsheikh M.D. Lenza Eye Center provides complete eye care from vision screenings to treatment of visual disorders. Dr. Alsheikh specializes in the treatment of cataracts, glaucoma, corneal diseases, and general ophthalmology. The patients at Lenza Eye Center receive the latest treatments and management of vision disorders from an experienced and compassionate eye surgeon. Dr. Alsheikh is the medical director for Lenza Eye Center. He has extensive experience in quality management for the healthcare field. He has served as the Quality Care Committee Chairman at the University of Texas Medical Branch and currently oversees quality management at a large multi-specialty ophthalmology clinic in San Antonio. Lenza Eye Center was designed to provide the highest level of care by creating a modern high-tech eye care facility based on the needs of its patients. It is Dr. Alsheikh’s commitment to patient care that drives Lenza Eye Center to the top of the industry. Patients faced with vision loss entrust their eye care to Dr. Alsheikh. He has earned a strong reputation for treating complex conditions. He has diagnosed and treated patients with severe glaucoma, severe dry eyes, corneal dystrophies, inflammatory ocular disease, and complex cataracts. In addition, Dr. Alsheikh specializes in LASIK surgery and post-LASIK management. Currently Dr. Alsheikh is accepting cataract surgery patients, glaucoma patients, and LASIK patients at the Wilsonville office. Visit our Eye Surgery page for more information. 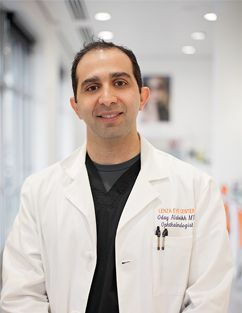 Dr. Alsheikh received his medical degree from Texas Tech University, and his ophthalmology training was completed at Oregon Health Sciences University. He also completed specialized training at University of California San Diego for corneal transplantation, Lasik surgery, and complex cataract surgery. In his off time, Dr. Alsheikh enjoys traveling, watching movies, and spending time with his family. He splits his time between San Antonio and Portland.